Rohn Boyd with Rohn Boyd Luxury Real Estate-eXp Realty in Kauai recently earned The Institute for Luxury Home Marketing’s Million Dollar GUILD™ recognition for experience, knowledge, and expertise in million-dollar and above residential properties. 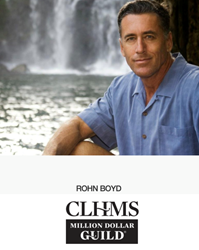 Rohn is a Certified Luxury Home Marketing Specialist™ (CLHMS), an exclusive group of real estate professionals who have completed The Institute’s training and have a proven performance in the upper-tier market. The specialized training and ongoing membership with The Institute provide Rohn with the knowledge and tools to better serve affluent clients. The GUILD recognition provides evidence of the successful commitment to service at the highest level. “My passion for Kauai paired with my extensive knowledge of the luxury real estate market set me apart. I offer my clients a concierge level of service that goes far beyond the transaction itself, providing them with unparalleled attention to their needs,” said Rohn. Rohn has been in real estate since 1995 and specializes in luxury residences, fine properties, and building/renovations consulting. From crafting respectable skills in trade and negotiation to providing leading market data to his clients, his business core reflects a dedication to proven service and value-driven results. Rohn received the Keller Williams Luxury Division “Highest Priced Listing” award and the Keller Williams Luxury Division “Most Listings Over 10 Million” award. Rohn represents exceptional clients transacting exceptional properties on Kauai. For more information about the luxury market in Kauai, contact Rohn Boyd with Rohn Boyd Luxury Real Estate-eXp Realty at 808-652-0530 or RohnBoyd(at)gmail.com.